#CamptonCX is back, brought to you by Training Bible Cycling, Bicycle Heaven, and the CCC. 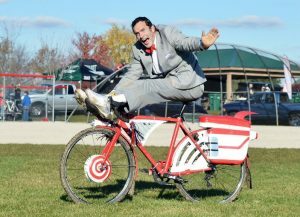 It is one of the original ChiCrossCup races and the best Halloween party on two wheels. The course will be back to it’s original direction and with a couple of fun little additions at Anderson Park in Campton Township (5N180 Brown Rd, Campton Hills, IL 60175). There will be a food vendor on site selling brats (from Reams! ), vegetarian chili, all beef hot dogs, sausage/egg/cheese croissants, muffins, fruit, pop and water. The Costume Contest is on!! Rule #1, you have to race in your costume. Rule #2 is that there are no more rules. There is plenty of parking on site. Please do not ride or drive on the grass surrounding the course. We hate having to kick our CX sisters and brothers off of the grass, and would doubly hate to have to use our potato launcher. There is a bike path just north of the park that is great for a warm up. The course: Running anti-clockwise with many of the classic rad Campton features and a new route through the woods. As always the final route could be different on Sunday. Two that can be hopped. Does the Rad section have the death wall or the bathtub jump? Helltrack rules!! trying to lurk but it’s showing as not viewable.